Theme: Walking Where Jesus Walked. 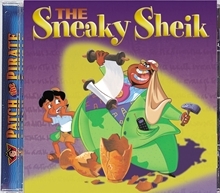 The Sneaky Sheik will transport your children to the places where Jesus walked. Together with Captain Patch and his crew they'll visit Capernaum, Galilee, Jericho, and Gethsemane. They'll learn of the preciousness of God's Word and the priceless gift of His Son.